The eastern province host Zebre tomorrow in the first of two games against Italian opposition before their Champions Cup semi-final. Josh Murphy will make his ninth senior appearance tomorrow. A WELCOME CHALLENGE, it must be said, but the task facing Leo Cullen over the next fortnight is finding the right balance between maintaining momentum and ensuring his key players are in prime condition for a Champions Cup semi-final. To that end, the Leinster head coach has been able to name a strong team for tomorrow’s Guinness Pro14 clash with bottom-of-the-table Zebre at the RDS [KO 2pm, TG4], while also giving several fringe players the opportunity to stake their claim for the Scarlets showdown. Cian Healy, Tadhg Furlong, Devin Toner and Dan Leavy all start for the province despite clocking up plenty of minutes during Ireland’s Six Nations campaign and putting in big shifts during last week’s win over Saracens at the Aviva Stadium. 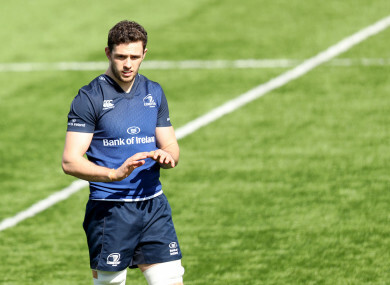 With the likes of Jack McGrath, Joey Carbery, Jordi Murphy, Andrew Porter and Sean Cronin granted time off this week, the idea is that those players will come back in for Benetton Treviso next weekend as Cullen carefully manages his resources heading into the business end of the season. “There is a balance,” Cullen admitted. “You’ve got guys coming off the Six Nations, guys who haven’t been involved and guys who are coming back from injury so all the while you’re making assessments on the individuals. “We want the individuals to give the best of themselves when they play for Leinster so that’s the most important thing for us. We’ve tried to manage them well so when they’re out on the field it’s the best of themselves that you’re seeing. Back-to-back home games against Italian opposition also presents a number of younger players the chance to show their wares on the first-team stage having impressed for the ‘A’ team in their run to the B&I Cup semi-finals. Conor O’Brien is set for his first start at the RDS in midfield alongside Rory O’Loughlin, while Vakh Abaladze, Peadar Timmins and Ciaran Frawley will all hope to get more senior minutes under their belt. And a big day for UCD’s Gavin Mullin, the son of former Ireland and Lions centre Brendan, who could make his debut off the bench, with Leinster’s backline having a less grizzled look to it. Barry Daly returns to the fold to start at fullback in a back three with Adam Byrne and James Lowe while Ross Byrne and Jamison Gibson-Park make up the half-back pairing. “We were really impressed with how some of the guys went [for the 'A' team] so they’re being rewarded,” Cullen explained. An afternoon of opportunity awaits, then, but such is the expectation placed on these young players that Cullen won’t accept any let-up in standards, with the former second row stressing the importance of securing a home semi-final in the Pro14. Leinster are currently three points ahead of Scarlets in Conference B and victory against Zebre will put them in a strong position to finish top, which is more important than ever this season with the introduction of a quarter-final stage at the end of the regular season. “It’s an important game for us as well, and we’re at home,” Cullen continued. “Zebre have caused a number of teams a lot of problems as well so we’re targeting this game like we have all the other games. “It’s important for us to keep momentum going and important to stay ahead of Scarlets in the league as well. “We’re looking to try and finish top as you can manage things slightly on your own terms over the next couple of weeks. It’s important for us to build a little bit on last week’s performance and really focus on ourselves and do everything that is in our control. Email “Cullen striving for selection balance as Leinster hunt down Pro14 top spot ”. Feedback on “Cullen striving for selection balance as Leinster hunt down Pro14 top spot ”.